In this piece I invite the viewer to experience an a-minor chord as if it were a three dimensional object. 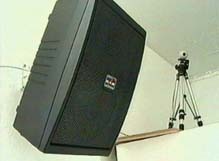 The installation consists of a white room with a speaker mounted on three of the walls and a notestand, with an empty sheet of note paper, standing in the center. When the viewer approaches the room, there is silence. Upon entering, a low a minor chord is heard, coming from nowhere in particular. However, if the viewer approaches any of the three speakers, one of the three notes making up the chord, is heard an octave higher than the ambient lower chord, making that single note discernible from the whole of the chord. Thus, by traveling around the room, the viewer is able to experience different aspects of the chord as would happen if one traveled around an extremely abstract three dimensional sculpture.